American Vice President-elect Mike Pence saw the Broadway show "Hamilton" in New York City over the weekend. The play tells the story of Alexander Hamilton, one of America's founding fathers. Hamilton was killed in 1804 in a duel with Vice President Aaron Burr. The real story is surprising and dramatic. Also surprising and dramatic is the fact that the show "Hamilton" is a hip-hop musical. Many of the people who play the historically white founding fathers are African-American or Latino. Its lead performer is openly gay. Just after the show ended Friday night, actor Brandon Victor Dixon gave a speech on stage. Dixon plays Aaron Burr, America's third vice president. The actor spoke directly to Pence, who will soon be America's 45th vice president. He told Pence that the show's diverse performers are worried about the country's future. He also said he hoped the show had inspired Pence. "We, sir, are the diverse America who are alarmed and anxious that your new administration will not protect us, our planet, our children, our parents, or defend us and uphold our inalienable rights," Dixon said. "We truly hope this show has inspired you to uphold our American values and work on behalf of all of us. All of us." 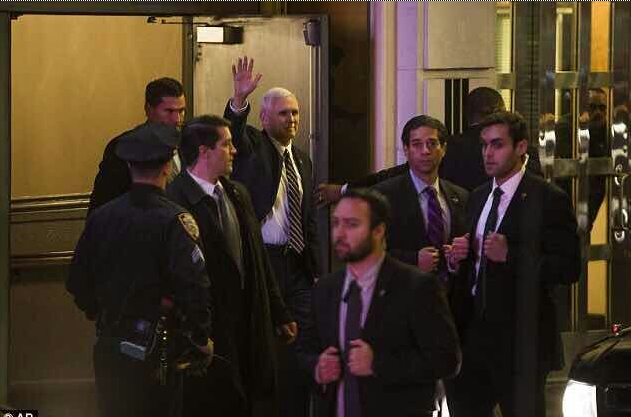 The vice president-elect exited the theater before Dixon finished his speech. Some people in the audience called "boo" as he left. Dixon urged them not to. The Associated Press reported that a show official told them Pence stood in the hall outside the theater and listened to the rest of Dixon's speech. The speech did not please President-elect Donald Trump. Trump wrote on his Twitter page that "our wonder future VP Mike Pence was harassed last night at the theater by the cast of Hamilton." In another tweet, he said that the cast of Hamilton should apologize to Pence. Dixon responded to the president-elect on Twitter. He wrote, "Conversation is not harassment sir. And I appreciate Mike Pence for stopping to listen." Trump tweeted again on Sunday about the issue. He wrote, "The cast and producers of Hamilton, which I hear is highly overrated, should immediately apologize to Mike Pence for their terrible behavior." Supporters of President-elect Trump also were not happy. They called for a boycott of "Hamilton." The hashtag Boycott Hamilton became a trending topic on social media. Some people, however, believed that a boycott of one of Broadway's most popular shows ever was not likely to happen. Mike Pence himself has said that he was not offended – or upset – by Dixon or the "Hamilton" cast. He told Fox News on Sunday that he attended the show with his daughter and some of her friends. He said he heard some of the booing in the crowd, as well as some cheers. Pence said he told his daughter, "That's what freedom sounds like." Modern China's founding father, Sun Yat-sen, proposed a dam in 1919. To activists, abortion is either murder or the inalienable right of every woman. Today African-Americans are 12 percent of the population. His vice president also had to resign in disgrace. 1.The hashtag Boycott Hamilton became a trending topic on social media. Social media undermines this process. 2.He said he heard some of the booing in the crowd, as well as some cheers. They visited some factories, hospitals as well as the school. It is in his best interests as well as yours.